Megan McArdle is a libertarian journalist who occasionally makes waves by being intelligent and independent-minded and willing to say publicly what she thinks. Her latest wave-making exercise: There’s Little We Can Do to Prevent Another Massacre. McArdle is the libertarian super-genius who thinks training little kids to gang-rush crazed gunmen, kamikaze-style, would be a far saner and more effective policy to stop gun violence than some latte-sipping liberal conspiracy like stricter gun laws. The idiocy of this suggestion is so perfect it’s downright inspiring. A zillion points for Gryffindor! I think the point McArdle is making is animated at some level by the same disgust I feel with the media response. Yes, I get that you feel really, really badly about the senseless killing of lots of innocent children and their teachers. Guess what? Everybody else feels exactly the same way. But the problem of an event like the Newtown shooting is an actual problem in the real world. It will be solved (or not) by reasoned action, not by your outraged feelings. Yup. Emotion is a terrible guide to action, because emotional outrage is such a ready handle for manipulation by the irrational and unscrupulous. Why we are poles apart on climate change – from Nature, a good overview of Kahan’s views and research. Doesn’t get too technical. The science communication problem: one good explanation, four not so good ones, and a fitting solution – From Kahan’s blog for the Cultural Cognition Project (CCP) at Yale, here’s an overview of his remarks at a recent panel discussion at the Committee for Skeptical Inquiry’s CSICon Nashville conference. NARP: National Adaptation and Resiliency Plan — it both pays for & “frames” itself – Another blog post from the CCP site, this one outlining some of Kahan’s thoughts about something I’ve been thinking about for a few years now: that adaptation efforts (as distinct from mitigation) could serve as a point of entry with people who are culturally biased against believing in climate change, giving them a chance to do something real and useful, while exposing them to information that in time might lessen their resistance to mitigation. New paper: Cognitive Bias & the Constitution of Liberal Republic of Science – From the CCP site, heres an overview of a new paper Kahan is publishing (the full 26 pages of the paper are downloadable in PDF form here). More math, and the language is a little daunting at times; I haven’t read the entire paper yet myself. But it sounds like it provides a pretty rigorous view of where Kahan’s research has led him. Science communication & judicial-neutrality communication look the same to me – Notes from a panel talk Kahan gave recently at a conference on the Supreme Court and the public at the University of Chicago-Kent Law School. More accessible than the Cognitive Bias paper, and fascinating (to me) insight into this whole question of what expertise is, and how we, the non-expert, can reliably benefit from it. From the beginning: The (Imaginary) Trial of Peter Gleick. Disclaimer: This is a work of fiction. It features characters based on real people and evidence based on real events, and is as close to reality as my whim and imagination allow. But it’s completely fake. We join the court session already in progress. The prosecution has just finished giving its opening statement. Defense counsel? Will you be making an opening statement at this time? The Defense Counsel remains seated. He or she stares straight ahead, hands laid flat on the surface of the defense table. The jurors are silent, watching. The silence lengthens; five seconds, ten seconds. The Defense Counsel, still sitting, lays his or her head on the table and sights along it. That’s a simple explanation. Right? Nice and simple. Just take a look. Sure looks flat to me. Done. The Defense Counsel slaps a hand on the table, then brushes both hands together in a gesture of finality. Or how about this: The earth is the center of the universe, and the sun and stars revolve around it. The Defense Counsel points at the ceiling, tracking the path of an imaginary celestial body across the sky. Simple. Obvious. I mean, look: There it goes. The Defense Counsel turns, and for the first time, looks at the jury. The Defense Counsel stands, then walks into the well in front of the jury. The flat earth, the sun and stars revolving around it, the prosecution’s simple explanation for the case of Dr. Peter Gleick: All of those are things that, from a certain perspective, are easy to believe. But in each case, that belief is wrong. Because the earth is not flat. It is not the center of the universe. And the case of Dr. Peter Gleick, when you look at it with an honest and open mind, is anything but simple. The Defense Counsel turns and walks slowly away from the jury for a few paces, then turns and faces them again. William of Ockham. William of Ockham was an English friar who lived in the 1300’s. He’s remembered today for one thing: a principle of logic called “Occam’s razor.” Basically, it says if you have two explanations for something, you should prefer whichever explanation is simpler. The Defense Counsel smiles, and gestures toward the Prosecutor. The prosecution is a big fan of William of Ockham. Because the explanation they want you to believe is a simple one: You’ve got this one guy, the defendant, Dr. Peter Gleick, who admits doing a bad thing. So he must be the bad guy. The people he did the bad thing to, the Heartland Institute? They must be the good guys. So if you’ve got anything else you need to explain, you just find a way to fit it into that theory. There’s a mysterious strategy memo that paints Heartland in a bad light? Well, they’re the good guys, so the memo must not be true. Who would fake such a thing? Oh, right: the bad guy, Dr. Gleick. Easy! The Defense Counsel brushes his or her hands together and walks briskly away, then slows, stops, and turns back toward the jury. Or is it? Albert Einstein once said, “Everything should be kept as simple as possible, but no simpler.” What he meant was, you have to get the facts of the situation first, before you try to come up with a theory to explain those facts. Using Occam’s Razor before you know the facts is a good way to cut your own throat. It’s a good way to come up with a theory that says the Earth is flat, or the sun and stars revolve around it. Sure, it’s simple. But it’s wrong. The Defense Counsel walks up to the jury box and stands directly in front of it, looking the jurors in the eyes by turn. The Defense Counsel ticks off “one” on his or her fingers. Fact: The organization whose internal documents Dr. Gleick obtained, the Heartland Institute, is not some innocent victim, a poor little think tank promoting research and education. They are sophisticated liars, with an extremist ideological agenda and a history of pushing misleading information intended to confuse the public about things like the health risks of cigarettes and the dangers of pollution. Fact: At least one person associated with Heartland publicly identified Dr. Gleick as the likely source of the leaked documents days before Dr. Gleick admitted doing so. How did that person know Dr. Gleick was the source? Was it from a remarkably astute reading of clues in the strategy memo itself, as the prosecution would have you believe? Or was it that the accuser knew Dr. Gleick was the source, because the accuser had forged the strategy memo himself and intentionally leaked it to Dr. Gleick beforehand? Fact: Dr. Gleick is not a stupid man. By his own admission he showed bad judgement under pressure, but that’s not the same thing as being stupid. Yet the prosecution’s so-called “simple” explanation requires us to believe that Dr. Gleick, having obtained Heartland’s internal documents, was stupid enough to think it would be a good idea to forge an additional document that made Heartland look worse, even though that additional document contained almost nothing new that was not already present in the legitimate documents. According to the prosecution’s theory, Dr. Gleick was stupid enough to think it would be a good idea to release this forged document along with the legitimate ones, even though Heartland would immediately know it was a fake. Even though he would be handing Heartland a made-to-order way to cast themselves as victims and shift attention to the forgery, rather than to the embarrassing information in the real documents. According to the prosecution’s “simple” theory, Dr. Gleick was stupid enough to think it was a good idea to include a direct reference to himself in the text of the memo, in effect planting a neon sign of his own guilt. Now I ask you, does that sound like the kind of thing that an intelligent man, intent on exposing his enemies’ wrongdoing without revealing himself as the source, would do? The Defense Counsel walks to the front of the defense table and gestures toward the empty chair left for the defendant. The prosecution pointed out for us that Dr. Gleick is not in the courtroom today, and that under our system of justice he is under no obligation to testify against himself. What the prosecution didn’t mention is this: That rule comes from an even more fundamental principle of our system of justice: The presumption of innocence. In a criminal trial, the burden of proof is on the prosecution. They must make their case beyond a reasonable doubt. The Defense Counselor walks back to the area immediately in front of the jury box and faces the jury. The prosecution’s “flat earth” theory, the theory that Dr. Gleick forged the strategy memo himself, is simple. I think it’s too simple. Your job as jurors will be to listen to the facts, all the facts, that are going to be presented in this trial. To weigh those facts honestly, with an open mind. And only then, only after you’ve considered those facts, to decide whether the prosecution’s “flat earth” theory still makes sense, or whether there might be some other theory, not as simple, maybe, but better at explaining what actually happened. And if there is a better theory, or even if you end up deciding that we just don’t know enough to say with confidence what actually happened, well, then your job will be to be honest about that, too. The Defense Counsel smiles at the jury. I don’t know what you’ll end up deciding. I know what I think, but what I think doesn’t matter. It’s what you think that matters. All I ask is that you consider the facts with an open mind. And remember: The earth is not flat. And this case is not simple. The Defense Counsel sits down. Next: Part 4: Prosecution Witness Donna Laframboise. All rise. The Imaginary Court of the Internet is now in session. The honorable Judge Mumble K. Mumbles presiding. The Judge enters and takes his or her seat behind the bench. Prosecution? Are you ready to make your opening statement? The Prosecutor stands and approaches the jury. This is a simple case. Now, don’t get me wrong; parts of it will be complicated. For one thing, we’ll be looking at some questions involving climate science, and that stuff can be hard to understand. Especially for someone like me, who isn’t a scientist. The Prosecutor turns from the jury box and walks toward the defense table, stands in front of it, and lays a hand on it, fingers outstretched. We need scientists. People drawn from our best and brightest. People who have trained for years under the supervision of other scientists, mastering the knowledge and techniques of their field. Demonstrating the quality of their intellect. Demonstrating the quality of their character. The Prosecutor turns from the defense table and walks back toward the jury. The Prosecutor pauses for a moment before continuing. Trust is crucial for scientists, because they come to us and say those sorts of things. They say, “This is how the universe works. This is what is going to happen. So this is what we must do.” We need to be able to trust that advice. To trust that they’ve done the science right, that they’re being honest with us. That they haven’t let something prejudice their conclusions, that there isn’t some all-too-human failing that has compromised their judgement. The Prosecutor looks at the ground, gives a low chuckle and shake of the head, then looks up at the jury again. While talking, the Prosecutor returns to the defense table. This time, though, the Prosecutor walks behind it, past where the Defense Counsel is seated, to where an empty chair has been left for the defendant. The Prosecutor stops behind the empty chair. Unfortunately, as you will learn in the course of this trial, this isn’t a hypothetical scenario I’m describing. This is exactly what the defendant, Peter Gleick, has done. As you will learn, he used to be a respected scientist. But over time he gradually became the sort of person who wanted to be right, to win the argument, regardless of the truth. Peter Gleick became an activist, an advocate, a True Believer, someone so committed to his cause that he lost sight of all other truths. He became so convinced of his own rightness that he was willing to use his authority to try to silence others, to shut down debate. Worse than that, he was willing to engage in willful, deliberate deception. He admits to assuming a false identity to obtain private information, then leaking that information to others under false pretenses. He wanted to trick those others into publicizing the information, hurting his enemies while allowing him to remain concealed behind a smokescreen of scientific respectability. The Prosecutor puts a hand on the defendant’s empty chair. As you can see, Peter Gleick isn’t here. He’s being tried in absentia. He’s chosen not to participate in this discussion. Now, no one is required to give incriminating testimony against himself. That’s an important principle in our system of justice. Peter Gleick is completely within his rights to be absent as we consider the question of his guilt. And really, it doesn’t matter. The Prosecutor steps away from the defense table and walks back toward the jury. It doesn’t matter. Because again, at its heart, this case really is simple. Peter Gleick, by his own admission, has been dishonest and deceitful. And once we realize that, and look carefully at the evidence, it all becomes clear. It becomes clear that his sins run deeper than the things he’s admitted to. In his confession he claimed to be a victim. He said he’d been tricked by some unknown person into committing disgraceful and dishonorable acts. In fact, the evidence will show that this was just another layer of deception, that even as he made his confession, Gleick continued to lie. The Prosecutor strides toward the jury, voice rising. The facts of this case will make it clear that this entire affair, from the beginning, was his idea, and his idea alone. Peter Gleick found himself caught up in a public argument with the Heartland Institute, an organization that does research and education based on free-market principles. He was losing that argument. And he couldn’t accept that. Angry, embarrassed, desperate to hang onto his credibility and prestige, he came up with a risky strategy: He would use deception to obtain private documents from Heartland, then release those documents to the world. His deception succeeded -- but then he suffered the worst shock of all: The documents for which he had risked his professional career, the documents that were going to bring down his enemies, were unremarkable. They revealed that the evil cabal he had been fighting really was just what its supporters had been saying it was all along: a small and not very scary organization promoting research and education. The Prosecutor shakes his head. And here, Gleick showed his worst judgement of all. Faced with these facts, what did he do? The evidence will show that he then forged a new document, the so-called “2012 Heartland Climate Strategy” memo. He used information from the legitimate documents to give it an air of authenticity, but he embellished that information, enhanced it, coated it with a layer of sinister intent. In effect, Gleick forged the document he wished he had found. Like an experimenter willing to falsify data in order to get the results he wanted, he twisted reality to make it match his theory. Then he leaked that fraudulent information to the world, and sat back and watched the firestorm of controversy it created. The Prosecutor walks slowly back behind the defense table, and grasps the back of the defendant’s empty chair with both hands. There is a pause. The courtroom is silent. What Peter Gleick did was wrong, obviously wrong. But the mistakes he made offer a lesson to the rest of us. That lesson is this: No one is immune to human failings. Scientists -- like doctors, priests, and holders of high office -- need our trust if they are to do their jobs. But they must earn that trust. They must prove themselves worthy of it. And when one of them proves himself unworthy, as Peter Gleick has, we need to call him on it. We owe it to the people he serves. We owe it to his colleagues, the men and women who do meet that standard of honor and integrity every day. And we owe it to the perpetrator himself. We owe it to Peter Gleick to be honest about what he did, to look him in the eye and tell him it was wrong. Only in that way can we honor the truth. Only in that way can we give him the chance to begin a journey to real redemption. The Prosecutor steps away from the empty chair, gesturing toward it. If Peter Gleick were here today, that’s what I would tell him. With your verdict, you can tell him the same thing. Next: Part 3: Defense Opening Argument. From the Columbia Journalism Review, here’s a nice article that goes into detail on both journalistic ethics and legal issues as they relate to Gleick’s actions: Heartland, Gleick, and Media Law. Thanks to nomatter_nevermind for the link. I’ve been thinking about how cool it would be (strictly from a gossipy obsessive’s self-interested point of view) if the Peter Gleick / Heartland affair were to end up in court. It would be great to have all the arguments laid out pro and con, with a referee and rules of evidence and all that. It seems unlikely we’ll be getting that any time soon, so I thought I’d pretend. This is the result. I put it in screenplay format, since that seems as good a way as any to represent a fake courtroom drama. I plan to use public writing (magazine articles, tweets, blog posts, comments, and online reviews) by the various witnesses in an attempt to have them give testimony that is more or less true to their stated views, but I assume I’ll also be taking some creative liberties. I’ll provide sources for the witnesses’ statements, so you can verify how well (or poorly) I’ve done at keeping things real. I’ll send the witness testimony to the witnesses themselves privately, via email (assuming I can find their email addresses) prior to posting it, so they’ll have a chance to correct anything they think is being incorrectly attributed to them. I’m also willing to correct testimony after the fact if any witnesses object to the words I’ve put in their mouths. No idea if anyone will actually want to take advantage of that. The JUDGE enters the courtroom from a door behind the bench. He or she is imaginary, and looks more or less like you would expect a judge to look, depending on how judges look in your part of the world. The Judge takes his or her seat. Be seated. Bailiff, what do we have on the docket today? Your honor, preliminary proceeding and arraignment in the matter of the Internet vs. Peter Gleick. Are the parties present? Prosecution? Defense counsel present, your honor. The accused is not in court, and will not be appearing today. Hm. Given that this proceeding is imaginary, I suppose I must allow it. Let the record show that the accused is being tried in absentia. The Judge glances down and goes through some papers. Your client, Dr. Peter H. Gleick, stands accused of the following charges: That on or about January 27, 2012, your client did knowingly and with malice aforethought impersonate a board member of the Heartland Institute, entering into an email correspondence with a person or persons within that organization. That as a result of that deception, your client caused a representative or representatives of Heartland to email your client confidential Heartland information, including documents relating to the organization’s donors, activities, and budget. That your client subsequently used that illicitly obtained information to forge an additional document, the so-called “2012 Heartland Climate Strategy”, taking the form of an internal Heartland memorandum but with language specifically crafted to paint the organization in a negative light. That on or about February 14, 2012, your client sent these documents via email to a group of recipients, identifying himself only as “Heartland Insider”, with the intention that the recipients would publicize the documents, including the forged strategy memo, leading to public outcry against Heartland and embarrassment for its board members, staff, and supporters. Defense counsel, do you understand these charges as I have read them? Are you prepared to enter a plea on behalf of your client at this time? I am, your honor. My client, Dr. Peter H. Gleick, pleads not guilty. Very well. I accept your client’s plea of not guilty, and hereby set a court date of some date in the future when this blog’s operator has time to write the next installment. A quick procedural note: In keeping with the imaginary nature of these proceedings, we will be skipping all that boring pretrial stuff: no witness lists, pretrial motions, or jury selection. I assume there are no complaints about that. Anything else? The Judge glances around the courtroom. No one speaks. Next: Part 2: Prosecution Opening Argument. Charles C. Mann profiles Bruce Schneier’s view on the TSA’s “security theater” in the latest Atlantic: Does Airport Security Really Make Us Safer? The first time I met Schneier, a few months after 9/11, he wanted to bet me a very expensive dinner that the United States would not be hit by a major terrorist attack in the next 10 years. Recommended, and not just because Schneier won this would-be bet. He knows his stuff. Christina Shearer asks an interesting question: Will fossil fuel companies face liability for climate change? She’s not looking at the question of whether they’re liable for selling fossil fuels, but rather at the question of whether, by funding and disseminating research that they know to be false, they’re guilty of a tort, and can be held liable for damages. This question may soon be playing out in the courts. UC Davis Campus Police, Pepper Spray, Etc. I’m reminded of the incident from a few years ago, in which a UCLA student who refused to show his ID and then refused to leave the campus library was repeatedly zapped with a Taser by campus police (see 36 Views of Mostafa Tabatabainejad Being Tasered). Just as a strategic matter, I think it’s pretty clear that the student protesters “won” this exchange. By sitting down, linking arms, and refusing to relinquish their places, they placed themselves in the path of the authorities who would control their behavior. Those authorities, by resorting to force, and doing so in full view of lots of cameras, committed the same strategic error that was memorably depicted in the movie Gandhi, in the scene where non-violent protestors march on the salt works, knowing they will be clubbed, but marching anyway. The next step for the UC Davis protestors is clear, and it’s the same next step I wrote about in connection with the Tabatabainejad tasering at UCLA: Go back to the same place with lots of buddies, sit down and link arms, and dare the authorities to spray pepper spray in your eyes again. If enough of you are willing to do that, you win. If you really believe in your cause, believe in it strongly enough to stand up non-violently to those who would inflict brutal pain and, potentially, permanent injury or death, without being deterred (and, crucially, if there are cameras present, and if your actions are presented with sufficiently compelling production values to inspire others to follow your example), then you win. Unfortunately, you also run a fair risk of being tasered, pepper-sprayed, bludgeoned, or killed. If you watch the UC Davis video to the end, there’s a pretty compelling part where the cops are basically looking around at this angry crowd surrounding them, and you can see the thought going through their heads: This could really get out of hand. You can see them get scared. I’m not saying they were scared for their personal safety (though it would be silly to think that as human beings, they didn’t experience such fears). But I think they were certainly scared of being put into a situation that compelled them to escalate their use of force. It’s at that point that the guy does his “Mic check!”, and the crowd, collectively, tells the cops: Hey, cops. You can leave. Why don’t you? Again, I’m not sure I’m totally on either side here. But it’s a compelling piece of video. From Steve Benen, on the “appalling” (NYT editors) execution of a probably-innocent man: Reasonable doubt. I Do Not Want Mercy, I Want You To Join Me. I’m not saying any of this to ask you for mercy, but to ask you to join me. If you side with Mr Huber and believe that your role is to discourage citizens from holding their government accountable, then you should follow his recommendations and lock me away. I certainly don’t want that. I have no desire to go to prison, and any assertion that I want to be even a temporary martyr is false. I want you to join me in standing up for the right and responsibility of citizens to challenge their government. 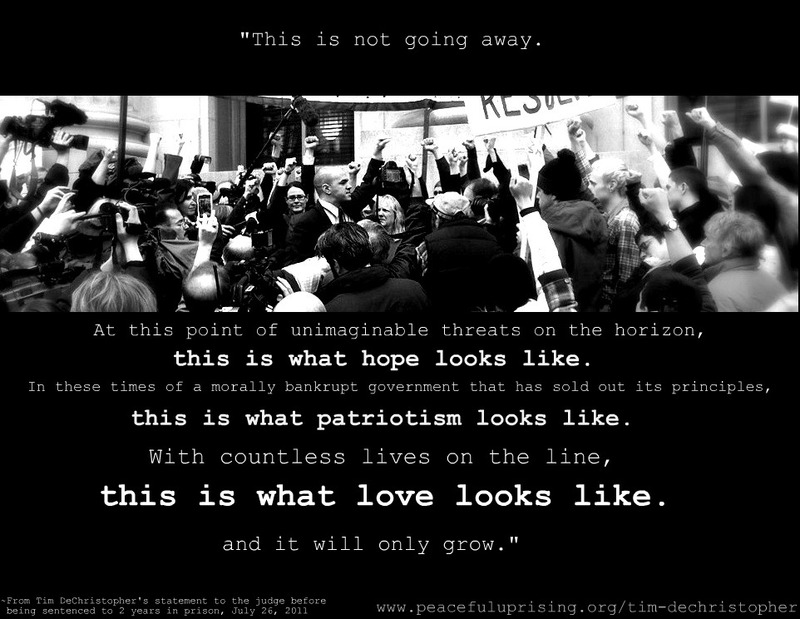 I want you to join me in valuing this country’s rich history of nonviolent civil disobedience. If you share those values but think my tactics are mistaken, you have the power to redirect them. You can sentence me to a wide range of community service efforts that would point my commitment to a healthy and just world down a different path. You can have me work with troubled teens, as I spent most of my career doing. You can have me help disadvantaged communities or even just pull weeds for the BLM. You can steer that commitment if you agree with it, but you can’t kill it. This is not going away. At this point of unimaginable threats on the horizon, this is what hope looks like. 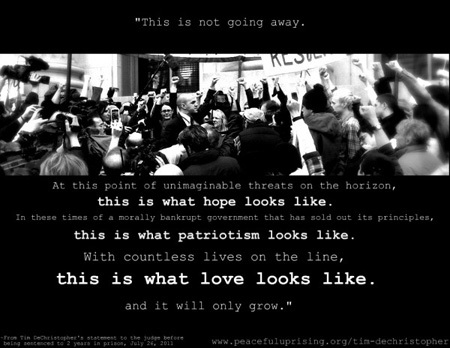 In these times of a morally bankrupt government that has sold out its principles, this is what patriotism looks like. With countless lives on the line, this is what love looks like, and it will only grow. The choice you are making today is what side are you on. After turning down a plea offer that would essentially have let him walk away in return for making a public apology, Tim DeChristopher is serving a 2-year sentence at a federal prison. More about Tim here: Frequently Asked Questions about Tim DeChristopher. This article from New York magazine by Robert Kolker is quite awesome: “I Did It” – Why Do People Confess to Crimes They Didn’t Commit? It’s several months old, but I hadn’t seen it until now. Highly recommended. John Callender, a Web developer for eBay and longtime political blogger on his site Lies.com, found himself obsessed with Ryder’s clothing choices, and couldn’t help but comment on them. “I was kidding at first, but then I realized her clothing choices were more interesting than the trial,” he says. It was fun, if kind of weird, being interviewed about fashion. For a trip down memory lane, see: WinonaRyderOnTrial. Apparently you used to be able to watch Lawrence Lessig give a very cool talk on copyright and free culture on YouTube, but now you can’t. Shame, that. A few days ago, Jonathan Bernstein pointed out that former Bush/Rumsfeld speechwriter Marc Thiessen was continuing to claim that the torture of Khalid Sheik Mohammed in 2003 helped foil a terrorist plot to crash an airplane into a Los Angeles skyscraper. This was obviously a lie. Why? Because the cell leaders of the LA plot were arrested a year before KSM was captured. Apparently this kind of crude, low-rent deception isn’t limited to Thiessen. It turns out that the same sort of clumsy lying was also part of the CIA’s classified “Effectiveness Memo,” which the Bush administration relied on to bolster its legal case for torturing terrorist suspects. Sigh. If there’s a better summary than “crude, low-rent deception” to describe the Bush administration’s whole approach to the justification of state-sponsored torture, I’d like to hear it. Fifty years ago, the American Law Institute provided the legal framework that underlies this country’s implementation of the death penalty. Now, the Institute has withdrawn its support from that framework. Michael Traynor, former president of the Institute, had a nice op-ed piece in the LA Times today explaining why the Institute took that action: The death penalty — it’s unworkable. In the decade after the institute published its law, which was part of a comprehensive model penal code, the statute became the prototype for death penalty laws across the United States. Some parts of the model — such as the categorical exclusion of the death penalty for crimes other than murder and for people of limited mental abilities — withstood the test of time. But the core of the statute, which created a list of factors to guide judges and jurors deciding when to sentence someone to death, has proved unworkable and fostered confusion and injustice. Now, after searching analysis by our country’s top legal minds, the institute has concluded that the system it created does not work and cannot be fixed. It concluded that we cannot devise a death penalty system that will ensure fairness in process or outcome, or even that innocent people will not be executed. The use of future tense (“or even that innocent people will not be executed”) is a delicate way around the obvious truth: Innocent people have been executed. Statistically, it’s a near-certainty. I am speaking for myself, not as a representative of the institute, but I can say with certainty that the institute did not reach these conclusions lightly. It commissioned a special committee and a scholarly study, heard various viewpoints and debated the issues extensively. A strong consensus emerged that capital punishment in this country is riddled with pervasive problems. These problems are entrenched in the death penalty system, both in California and nationwide. The cumulative result: Executions remain as random as lightning strikes, or more so, and that is the very problem the institute’s model statute intended to fix. In addition, across the country, at least 139 individuals have been released from death row after establishing their innocence. If a similar degree of effort had been devoted to establishing the innocence of those already executed, I have no doubt we’d have dozens of examples of that, too. Besides being a cool musician, Matthew Good is also a cool blogger, one deeply concerned by a lot of the same things that deeply concern me. Here he is doing his best to follow the logical thread of the Obama administration’s arguments on Guantanamo detainees. In particular, he’s looking at the subset of detainees who are deemed “too dangerous to release,” but who cannot be charged, presumably because the only evidence the government has against them was obtained by torture: The 47. Of course, detainees are not viewed as ‘prisoners of war’ by the US, rendering the application of the Third and Fourth Geneva Conventions moot. So given that US law doesn’t apply, and international law doesn’t apply, one has to ask the question – would simply eliminating them be breaking the law? Given the vast ambiguities used to justify their detention, the answer to that question is rather straightforward – the law isn’t applicable. If they can be detained indefinitely without legal recourse, then they can be killed without legal recourse. They aren’t prisoners of war, according to the United States they have no legal rights, so the law doesn’t apply. That said, if they are as dangerous as the Justice Department claims them to be, eliminating them wouldn’t be in breach of anything being that nothing applies. In the end, the only thing standing in the way of that option is negative publicity. When you get right down to it, the issue really is that simple. I think this might actually be a worthwhile avenue for the opponents of state-sponsored torture to take: Tell Obama to put up or shut up. If the rule of law means anything, then charge these guys or let them go. And if the rule of law doesn’t mean anything, then just kill them already, quickly and cleanly, rather than a little at a time by locking them away with no legal recourse for the rest of their lives. How the Texas criminal justice system executes the innocent: Cameron Todd Willingham, Texas, and the death penalty. And now, with bonus corruption and coverup from the governor: The lengths Rick Perry with go. You are currently browsing the archives for the the_law category.